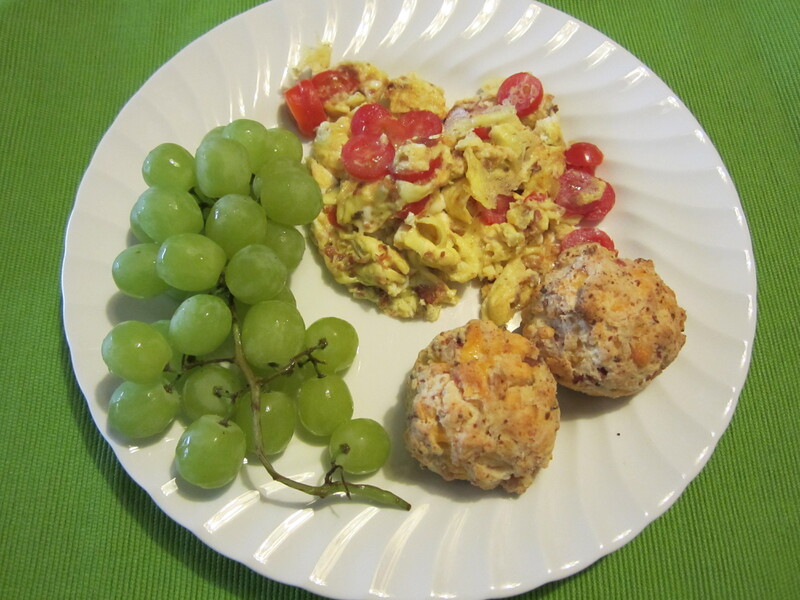 bacon – Cooking with Gabi – all about integrating Fruits & Vegetables into your daily diet! 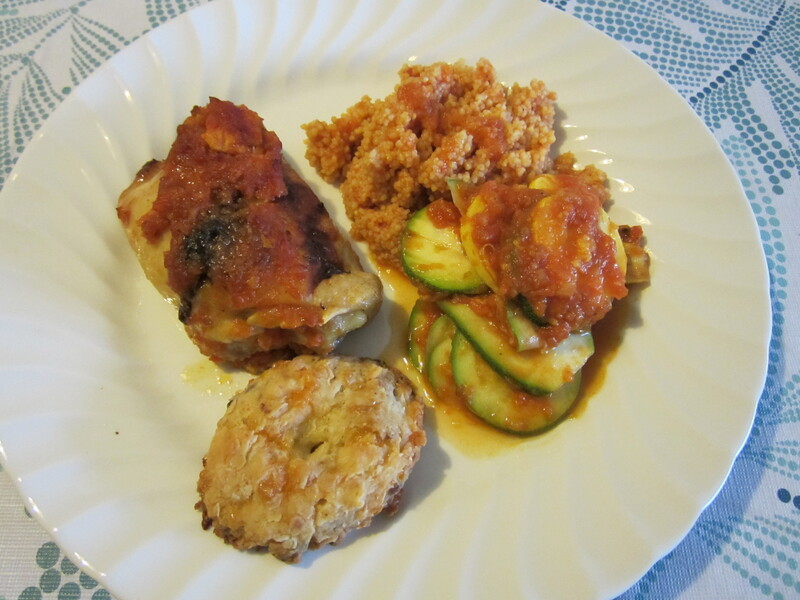 Tomato, Carrot and Onion Couscous…..with Chicken and a Zucchini side dish, accompanied with a Bacon Cheese Biscuit! It was the perfect afternoon to make some home-made comfort food! I took one tomato, four carrots and one large onion, chopped them all and broiled them with extra virgin olive oil and balsamic vinegar for about 10 minutes. Then they went into a pot with one 28 oz. can of crushed tomatoes, along with some sea salt and pepper, and about two cups of low sodium chicken broth, and allowed it to cook for at least one hour for the flavors to come together. In the meantime, I took chicken thighs, and broiled them covered in that vegetable mix for approximately half an hour, till the chicken was cooked through completely. Found a box of couscous, which was placed in a pan and covered with approximately one cup of the vegetable mixture; the couscous cooked rather quickly. While the chicken was cooking, I took out two cups of all purpose flour, 1 tablespoon of baking powder, 1/4 cup of chopped unsalted butter, 3/4 cup almond milk, 1 cup of shredded cheddar cheese and about 1/3 cup of parmesan cheese and mixed it well. Lightly tossed some sea salt on top of the mix and a dash of black pepper and kneaded the mix well together, and then with a rolling pin, rolled it out and decided to make unstructured biscuits and just took pieces of the mixture and stretched it out with my hands. No cookie cutter for this cheesey biscuit! The best part of this meal? I’ve got left-overs!!!!!!! I really love olives….in any way, shape and form! And yes, of course I included some green and black chopped olives in my lean hamburger meat….as well as 1/3 cup of Panko and one egg white to bind it all together….out of 1 lb. 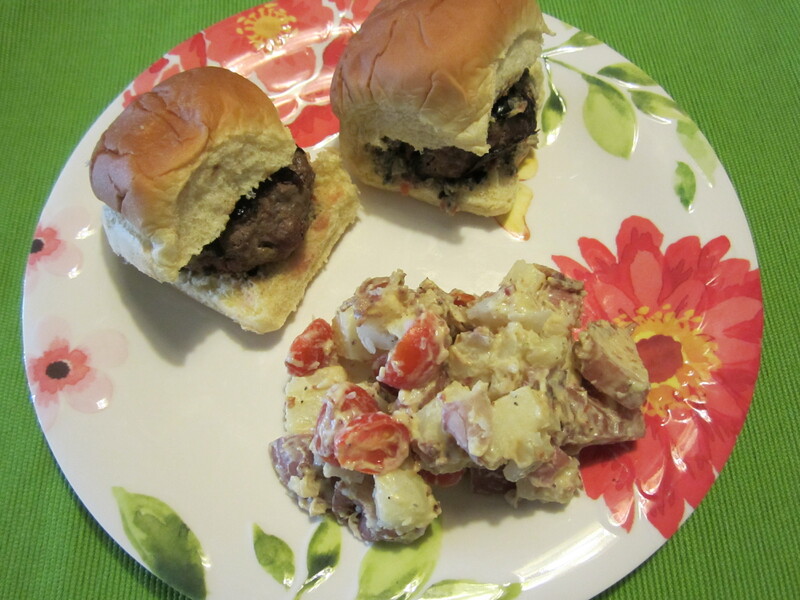 of meat, I made a dozen mini sliders…..super delish nice and hot on the cold olive tapenade….those amazing flavors coming all together….outrageously olivy! That’s all I can say…. But what about the potato salad, you ask? I had a couple of red potatoes, which are softer than regular white baking potatoes and boiled them till they were cooked through but not falling apart. After taking them out of the boiling water, shocked them in an ice bath, while I prepared the yummy dressing. Out came the Dijon mustard, low calorie mayonnaise, a dash of cayenne, cumin, a dash of turmeric, a dash of black pepper and 1/4 cup of crushed bacon. Mixed this together, chopped the potatoes into bite size pieces, and mixed in cherry tomatoes…..let me tell you….this was amazingly flavorful and this plate was just right! So sharing Psalm 128 is superbly apropos…. How joyful are those who fear the Lord – all who follow his ways! Your children will be like vigorous young olive trees (!!) as they sit around your table. That is the Lord’s blessing for those who fear him. Sriracha-Kimchee & Louisiana Hot Sauce Marinated Chicken! Yes, I like to live dangerously!! Having purchased a bottle of Sriracha and another of Kimchee sauce, I decided to mix it with Louisiana hot sauce! If you’re wondering if I tried it before I marinated the chicken, I will tell you that all I had to do was lightly sniff it and almost choked in the process! So I added in fresh lemon and lime juice, chopped some onions, found some bacon and decided to add that in to cut the spice a bit, and baked it on low for about 2 and a half hours. Let me tell you that it did not take the roof off my mouth! 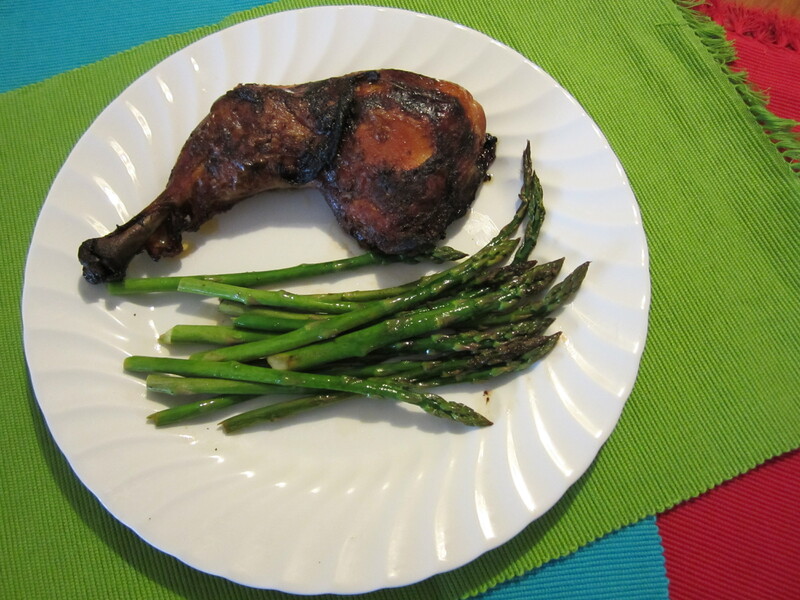 Because it cooked on low and for a while, it really gave the chicken a lovely crunchy taste….really good with asparagus, lightly cooked in 1/2 tablespoon of unsalted butter with fresh lemon juice……so good! Can’t wait to go now and have some leftovers……. Early Saturday Breakfast: Strawberry & Muenster Cheese Mini Sandwiches! Remember that yesterday I shared with you how my Tomato Soup Biscuits came about? Biscuit left-overs provoke me to think out of the box…..yesterday not only did I purchase those lovely vegetables to make the absolutely-aromatic-fill-your-tummy-with-goodness-tomato soup, I also found that they had the most extraordinary bright red, juicy strawberries! 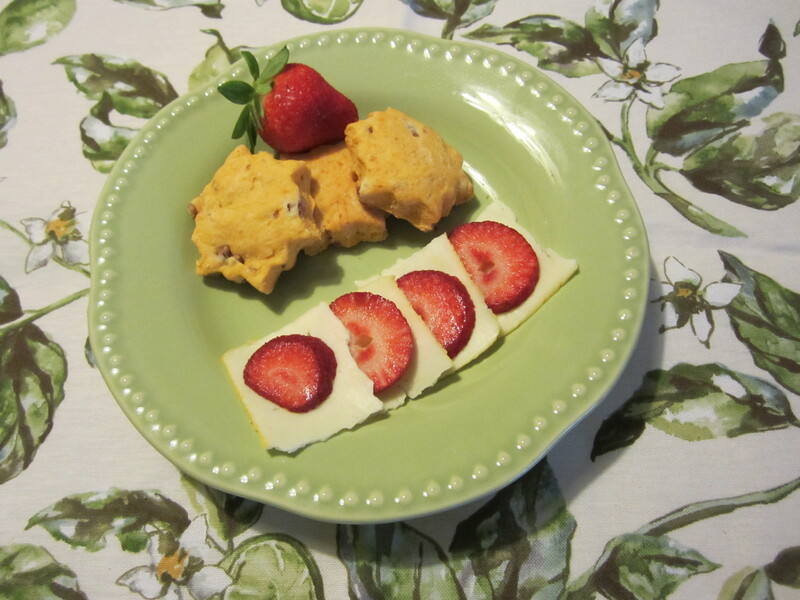 Knowing that I had Muenster cheese waiting for me in the fridge, out came the strawberries, left-over tomato-soup biscuits, awesome cheese…..what better combination for a mini-sandwich breakfast, accompanied with freshly grated lemon-ginger-honeyed hot tea??? I like to keep a lemon and fresh ginger in the freezer as it makes it so easy to grate….so one lemon was grated as well as one healthy heaping spoonful of freshly grated ginger went into 2 cups of boiling water, with the fresh lemon juice of the grated lemon, and a friendly drop of honey made this beyond delish….a wonderful accompaniment to the light strawberry-Muenster cheese mini sandwiches for Breakfast! Final Outcome!!! 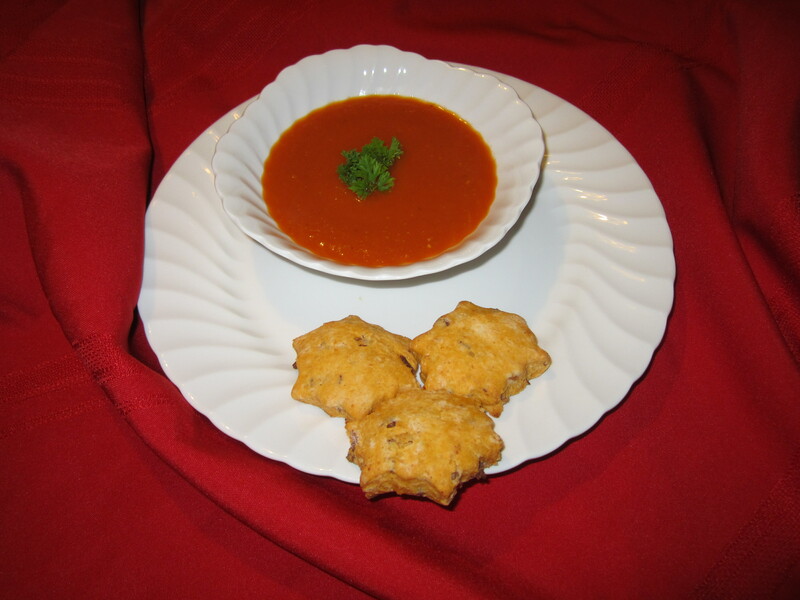 Superbly flavorful Tomato Soup with Parmesan-Bacon-and Tomato Soup Biscuits! Awesome Tomato Soup with Parmesan-Bacon-n-Tomato Biscuits! Best comfort food for a chilly day in Miami? Why, Tomato Soup, of course! Woke up to 56 degrees……but in Miami, that feels like it’s a lot colder than it really is! I bundled up to go to work, in Boots, Sweater, Scarf and Coat. Yes, it was That Cold to me. On my way home, I passed an open field where they were selling fresh fruits and vegetables….so I stopped and walked right up to the stand where they had some gorgeous colorful vegetables. My grumbling stomach said…it’s time to make Tomato Soup! 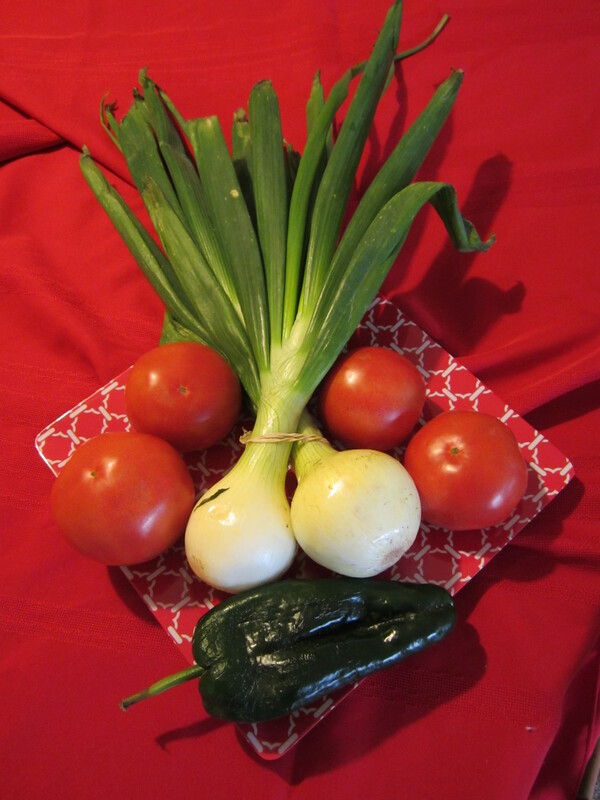 I purchased some large tomatoes, a poblano and vidalia onions. Couldn’t wait to get home in order to start creating a new style of tomato soup. As soon as I walked into my kitchen, out came a large cookie sheet, where I spread out the tomatoes, poblano pepper and vidalia onions to broil them first. Into a stovetop pot went garlic, tomato paste, tomato sauce, dash of kosher salt, pepper, smoked paprika, and the juice of one lemon, as well as two cups of low sodium chicken broth. As soon as I could smell the lovely aroma of the broiled tomatoes and the vidalia onions, the tomatoes were peeled, and then were chopped up with the vidalia onions and the poblano pepper, and all went for a swim with the rest of the ingredients in the stovetop pot. After a good 20 minutes, small batches of the soup went into a blender, where it liquified the vegetables together….such an amazing aroma came from this light and superbly flavorful soup. But there was something missing…..I always keep my biscuit mix nearby, so in went one cup of the tomato soup, as well as half a cup of parmesan cheese and 1/3 cup of chopped bacon. In just 12 minutes at 400 degrees, the tomato soup biscuits were done! Yum……now where did I put my soup spoon???? A Healthy Alternative for Brunch after a good Insanity Workout!!! and from the cupboards, salt and pepper. Heating a pan on high, after a light olive oil spray, went the asparagus with tomato, a dash of salt and black pepper, which I allowed to cook for about 5 minutes. While that was cooking, I whisked the two eggs with the crumbled bacon and cut up some leftover baked chicken (half a cup, cubed). As soon as the asparagus was cooked, in went the chicken and the eggs and everything got cooked together. When the eggs were done, I integrated them together and you could say that I created my own style of “fritata” with these healthy options. I found that I had some flat bread in the fridge, so out came one which was placed on the plate and the veggie mix went on top. It was healthy and delicious!